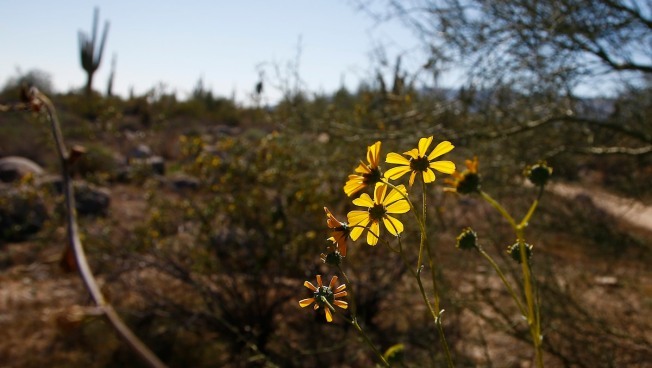 Desert flowers bloom along the Maricopa Trail inside the White Tank Mountain Regional Park Wednesday, Nov. 28, 2018, in Waddell, Ariz.
An Arizona man fulfilled the Christmas wishes of an 8-year-old girl in Mexico whose letter to Santa reached him by way of balloon this month, NBC News reports. Randy Heiss saw the ragged remains of a balloon with a note attached while he was hiking in Patagonia, Arizona. The note said "Dayami" on one side and the other had a numbered list written in Spanish. "It really touched my heart to find it and I said, 'Well, how in the heck am I going to be able to figure out how to make contact with this little girl and make her wishes come true?'" Heiss told Tucson NBC affiliate KVOA.